This luxury 6 bed home comfortably sleeps 12 people and boasts one of the best locations in Aviana Resort with a conservation view at the rear of the home and only a short walk to the clubhouse and communal pool. If you get "themed parked out" don't worry! It's all here waiting for you. Relax with a Gin and Tonic by your own private pool with free pool heat, watch the kids enjoy hours in the pool, and take some time for yourself to rest those tired legs and take in the Florida Sunshine. This elegant home has been furnished to a really high standard and offers all the comforts of a home away from home. The modern decor has a warm atmosphere as you immediately walk in the front door and when the time comes you won't want to leave. Prepare your favorite meals with this fully equipped kitchen, or relax in one of the living rooms upstairs or downstairs and watch your favourite movies on one of many Flat screen SMART TV's with Cable. The kids will love the games room which has a pool table and air hockey table, or bring your own games and play to your hearts content on the PS4, there is fun for the whole family.! 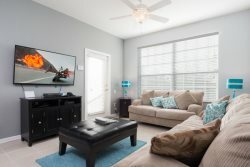 There is plenty of choice for Bedrooms with Two Master Suites with King Beds and en suites, Two Queen Bedrooms and 2 Full beds in the other Two Bedrooms, all with there own Flat screen SMART TV's with Cable in each Bedroom. With all of this and more, what are you waiting for? Book your Magical Vacation today! This was a nice comfortable villa, we really enjoyed our stay there, and the owners were fast to respond to any questions or concerns we had while we were there. The accommodations were great!! The house was immaculate. Really nice decor and everything you needed to keep the family entertained for two weeks. A great heated pool, PlayStation 4, games room, and TVs in every room. The beds were amazingly comfy, and the house was so spacious no one felt like they were on top of each other. Would I recommend it... YES. Will I be back..... YES. The location was great as well with only a short drive to Disney. It also had a club house, pool and gym. The people were great to answering any questions we had. Book it now before it gets booked up.